Outside brick size 17 in. x 21 in. fits outside brick dimensions from 16 1/2 in x 20 1/2 in to 18 1/2 in. x 22 1/2 in. The Duro-Shield 17 in. x 21 in. Aluminum Band-Around Brick Single Flue Chimney Cover is proof that you don't have to sacrifice any quality by choosing a remarkably well-priced item. Aluminum chimney caps are sturdy, lightweight, and more affordable that caps constructed out of other metals such as copper or stainless steel. 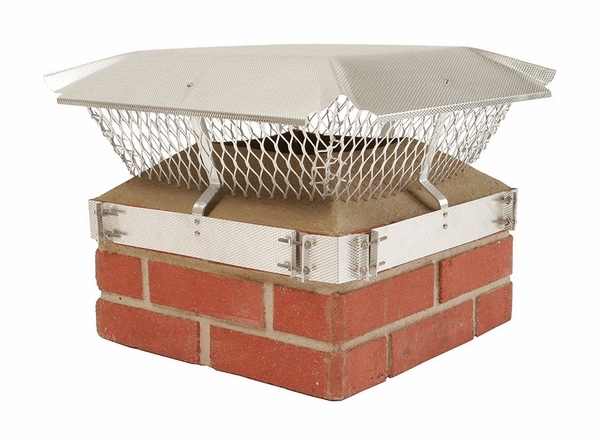 This chimney caps hood is constructed of solid 18 gauge diamond-embossed aluminum. There is a 16 gauge expanded aluminum mesh to help prevent birds and other critters from getting inside the chimney and causing costly damage. The extruded aluminum braces provide plenty of support, and the stainless steel nuts and bolts help ensure a firm, secure chimney mount. Chimney covers are not always made alike. You want quality and performance above all. When you combine maximum function with the best price available, though, there is no better choice than the Duro-Shield 17 in. x 21 in. Aluminum Band-Around Brick Single Flue Chimney Cover. What is the size of the mesh? I live in California and need half inch. This comes with standard 3/4" mesh. Unfortunately, we do not carry this cap with 5/8" California mesh. What are the measurements of the top (roof) of this Duro-Shield 17 x 21 aluminum band-around brick single flue chimney cover? The lid size is 22" x 23". How tall is this chimney cover? Per the manufacturer, the screen height (not including the mounting band) is approximately 6 inches, with another 1.5 inches added from the lid. I have tried many types of caps but this one is the best by far. Chimney cap is over the top (of the house) in quality! This is the only place I could find a chimney cap big enough (23.5"x23.5") to fit around our chimney. I ordered it easily online, it was delivered very quickly and was easy to assemble. It is now on our chimney and keeping the rain and birds out just in time for cold weather to begin. Thank you very much! I had to add 1/4"x1" shim for it tighten on my 16 1/4"x20 1/2 chimney. Chimney cap is well made a good value for the money unlick cheaper brands. Easy to assemble. Fast shipping, great product. I could not have asked for better. only thing that came close to fitting my chimney. Would have given it five stars, but I don't like the way the wire mesh goes together. Could have been made in one piece and folded or rolled. ProsNice looking, made of aluminum, adjustable. ConsI don't like the four piece mesh. Could have been designed much better. Very well manufactured product. Easy to assemble and install. Surprised it came unassembled. Easy, though, to assemble on my back porch. Instructions were poor suggesting only the least of interest in that part of the process. The product fit nicely and tightened easily as I balanced on the roof; except for the side farthest from me. The screws, you see, are a single, slotted standard head screw, not the easiest to work with when not in direct sight. Add to that a tottering perch on the top of a windblown roof and the possibility the cover would blow off before the last two screws were tightened and I found myself cursing your design team. Had the band either been secured by either screws with a Philips head or by wing nuts the process would have been much easier. Your company might think of the installer when choosing fasteners, not just acquiring the cheapest product.